How often do we focus our efforts in home security on the time when we’re away from the house? Most of us will double check that doors and windows are closed and locked and that the burglar alarm is set (if we have one) when we leave the house but we assume that as long as someone is in the house, our homes are pretty safe from the risk of burglary. However, there is a certain kind of burglary that actually relies on someone being in and takes place right under your nose in broad daylight. Distraction burglary is a term for when a burglar distracts their victim with a plausible excuse to enter the property or keep them occupied while an accomplice gains access. These types of burglars do tend to target those who are more vulnerable, such as older people, and you may think that you would never be taken in by such a scam but they can be very believable and they tend to play on people’s fear of risk, such as a danger to your property, or people’s concern for others, such as claiming to have lost a cat or broken down. Just looking around the net at recent reports of such burglaries we can see the kinds of cover stories they create to get into your home. A common theme is to pretend to be some kind of tradesperson: such as from the water company; offering to clean the guttering; or offering to do gardening work. 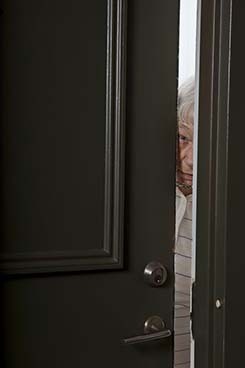 They knock on the door and offer their services and may either claim that they need to come in and assess something (such as read a meter) or their accomplice sneaks in while the first caller distracts you. Some may appeal to your willingness to help people in a difficult situation such as claiming to be locked out or looking for a lost pet. And many will play on people’s fears by inventing a situation peril that not only causes anxiety but forces you to respond quickly before you’ve had chance to really question the claim, such as checking for a gas or water leak or claiming that work nearby was likely to cause damage to property. We even read one where a woman claimed to have mistaken the house for a B&B while someone else sneaked in and stole a handbag. How can you prevent a distraction burglary? Obviously burglar alarms are not going to help you against this kind of break in but there are a number of things you can do to protect yourself involving both your physical security and how you deal with it. There are also a few things you can do to try and prevent them even trying it. → Display a ‘No cold callers’ notice on your door. This indicates that you’re aware of the risk will make many think twice before proceeding. It will also reduce the number of nuisance callers attempting to sell you things you don’t want! You can download a free one here. → Get CCTV installed. Few will go ahead with the scam if they can see that they may be caught on camera (they’d simply move on to another house that didn’t have CCTV). This may seem an excessive measure to prevent distraction burglary but remember of course that it will strengthen your general home security and it could be an expense worth paying for those who are particularly vulnerable. → Always make sure other doors are locked and any windows that someone could climb through are closed before you answer the door to anyone. Often they’ll be hoping to occupy you at the front door long enough for someone to sneak in at the back so make sure this isn’t possible. → Always submit your own meter readings. This way there won’t be a need to send anyone to read the meter so anyone claiming to be doing that can be dismissed immediately. Consider having a smart meter installed so that this is done automatically. → If the caller claims to be some kind of tradesperson, insist that you check their ID before allowing them in. If you have any concerns, call the organisation that they claim to be from to verify who they are but find the number yourself: if their ID is fake they could have someone on the end of the line briefed to back their story up. Don’t be afraid to close the door and check their ID while they wait outside. → If you are a tenant check with your landlord first before allowing anyone in who claims to be there to do work. They shouldn’t be arranging for anyone to come round to do jobs without notifying you so if they are unexpected then it could be quite likely that they’re bogus. → If someone comes to the house asking for help offer to call someone for them but don’t let them in the house. If they’re claiming to have lost a pet say you’ll look around yourself and take a number from them. If they ask for something like a glass of water, close and lock the door while you get one for them. → If you’re expecting a tradesperson round, pre-arrange a password with them or the organisation they’re coming from, so you know it’s them when they call. → Be equally as security conscious with a woman or a child at the door as you would be with a man. Men to perpetrate the majority of break ins but women and children have been known to be involved as well as people are much less wary of them. → Install a spy hole and security chain on your door. This will allow you to check who is at the door before you open it and you can use the chain if it’s not someone you recognise. An intercom system is even better as you could check who’s at the door, and dismiss them, without even needing to open it. In short, just keep your wits about you when answering the door to someone you don’t know. We’re not saying you should mistrust anyone knocks at the door but genuine callers won’t mind you taking precautions. We’d especially advise that you run through these points with anyone you think may at higher risk of being targeted. previous On holiday countdown? Don’t tell the burglars!